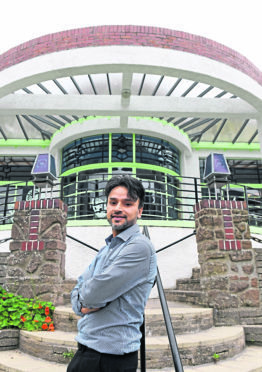 Raj Hamid, at Carron to Mumbai, restaurant, Cameron Street, Stonehaven. Picture by Kami Thomson. Immigration officers have raided a Stonehaven restaurant. Two men were detained following the raid at the Carron to Mumbai restaurant in Stonehaven on Friday. The Home Office said immigration checks found two Bangladeshi men, a 25-year-old who is allegedly a failed asylum seeker and a 33-year-old who has overstayed his visa, were in the country illegally. Last night, restaurant owner Syed Abdul Hamid – known as Raj – insisted the two men were not employed at the restaurant and urged his customers to keep an open mind. He said he carried out checks on all his employees, and said it was up to the Home Office to prove the men had been working there at the time of the raid. He said: “I don’t know who they are. “Our staff can bring anyone they want as their guest. “We can 100% say these people weren’t working on our premises. “One of them is a friend of the head chef and another is a friend of another member of staff that works part-time. “One was in the kitchen and one was outside just coming in. Immigration officers also visited Nu Spice on Allardice Street, Stonehaven, the same day. Checks found another two Bangladeshi men, aged 37 and 39, had overstayed their visas and they were detained. If it is found the pair were employed without the proper paperwork, the owners of Nu Spu could be fined up to £40,000. Sergeant Claire Smith said: “We welcome opportunities like this to work with our partners to help protect our communities by targeting immigration offenders and any people or businesses who are linked with employing them.